Firefox Developer Tools (Jeff Griffiths) - The Firefox Developer Tools team will be showing off the latest in web and browser development tools to anyone interested in hacking on web apps, add-ons or the browser itself. Firefox Metro (Windows 8) (Yuan Wang) - Firefox Metro is a touch-optimized browser built from the ground up for Windows 8. It's designed for comfortable touch browsing and the same time works well with mouse and hardware keyboard. Firefox Metro has a set of unique features to demo, including a clean and visual Start Page, in-context auto-complete screen, on-screen re-positional controls, windows 8 edge gesture-based browsing, etc. Peep: Secure Python Deployment Without Servers Or Vendor Libs (Chris Lonnen) - Historically, deploying Python projects has been a pain in the neck for the security-conscious. First, PyPI lets authors change the contents of their packages without revving their version numbers. Second, any future compromise of PyPI or its caching CDN means you could get a package that's different from the one you signed up for. We have historically solved this by running our own local PyPI servers, which means added burden in both system administration and people administration--figuring out who gets upload rights. Alternately, we sometimes sidestep the problem by creaing vendor libs, but that necessitates a lot of fooling around with VCSes, and it doesn't work so well with compiled libraries. Peep, a thin wrapper around pip, solves this problem. WebFWD & Hatchery (Didem Ersoz) - WebFWD is the Global Accelerator Program of Mozilla, helping startups from all around the world build and grow businesses. We work with startups with products that align with Mozilla's mission of promoting openness, innovation, and opportunity on the Web. Mozilla Hatchery is a support program for Mozillian's who want to help invent new Mozilla products. Mozilla Hatchery provides lots of support to take your prototype or product idea to the next level. We offer coaching, resources and curriculum across various disciplines - user research, testing, design, product development, marketing and more - with a goal to help build Mozilla's future products and services. Blackhole (Josh Matthews) - Blackhole is a system to aggregate and track Mozillians' contributions across our whole ecosystem. With this information, we can enable better recognition of contributors, and track the size and strengths of our community across all functional areas. We have a prototype set up and are actively working get integrating data from more systems. UX (Larissa Co) - This booth will showcase design work happening around Mozilla. We will staff the booths with designers during the Innovation Fair. We will have a display up with a running Keynote presentation that will showcase design work. There will also be printouts and mockups of design work posted up at the booth. We will also be handing out a UX Newsletter at the booth, posting up some design posters and handing out design schwag. UXR (Dominik Strohmeier) - The UXR booth will showcase User Research design studies and methodologies. Platform Games Initiative (Vladimir Vukicevic) - The platform games initiative is primarily focused on making Firefox the best it can possibly be at running games. Our goal is to make HTML5 rock on both Desktop and Mobile! Firefox Marketplace (Maureen Hanratty, Bill Maggs, Andy McKay) - Come find out what's in the works for Mozilla's HTML5 app marketplace. Talk to staff and see some demonstrations of collections, new concepts in app discovery, developer tools, and payments. Our app review team will be there as well to talk to you about becoming an app reviewer. What's New in Firefox Add-ons (Stacy Martin and Alina Hua, Amy Tsay and Jorge Villalobos) - We will demo excellent new add-ons for Firefox on Android, and talk about our current and upcoming projects to make the add-on experience even better. App Developer Tools (Alex Poirot and Myk Melez) - Check out the next generation of Developer Tools for working with Firefox OS apps, the App Manager, which includes a simulator and on-device debugging. Firefox for Android (???) - Discover why Firefox for Android is the best mobile browser out there, and what new and exciting things we have planned to make it even more awesome! Mozilla Appmaker (Flathead) (???) - Appmaker is a mobile app development platform which provides the web-based building blocks to build apps without any programming. Still in its infancy, the Appmaker team -- already comprised of Foundation and Corporation, and community members -- is doing research and continuous development to provide the most powerful and accessible solution. Socorro, crash-stats.mozilla.com (Adrian Gaudebert) - Discover what is new in the world of crashes! New search tools, new public API, new custom reports... Come and see what Socorro can do for you know, and let us know what you would like it to do for you tomorrow. Eideticker (Dave Hunt) - An "eideticker" is a person with a photographic memory. Eideticker is a performance harness that measures user perceived performance of web browsers by video capturing them in action and subsequently running image analysis on the raw result. Come and see the tests running, and find out how you can help us with automation. Australis Firefox Redesign (Matthew Noorenberghe) - Try out the new theme for desktop Firefox and find out more about the upcoming changes. HTTP/2 (Nicholas Hurley) - This is the next version of the protocol that powers the open web. Come see how it will improve the web experience for everyone. Talkilla (Mark Banner) - Talkilla is a videophone that makes it easy to talk with friends or co-workers. Chat across one or more web sites - no need to struggle with multiple apps or windows. Open Badges (Emily Goligoski) - The Open Badges Infrastructure makes it possible for badges issued by different teams and organizations to be interoperable and shareable across the Web. Thousands of earners around the world are using these Open Badges to realize increased learning and professional opportunities. Learn more about how you can issue badges to project contributors at the fair and @OpenBadges! Webmaker.org Scott Downe / Pomax Kammermans - Come test and learn about Webmaker.org! We've got tools, content and communities that are building a web literate planet. Come learn what this community of thousands of passionate makers and mentors did this year at the Maker Party, and where we plan to go next! OpenNews (???) - OpenNews is a collaboration between the Knight Foundation and Mozilla that's dedicated to building an ecosystem to help journalism thrive on the open web. It's about producing next-generation web solutions that solve real problems in news. It's about supporting communities of developers and journalists as they make, learn, and invent together. And it's about deploying fellows—and code—into news organizations to collaborate and innovate in new ways. Mozilla Ignite (???) - Building the Gigabit Web (Will Barkis) - Mozilla Ignite (mozillaignite.org) is an Open Innovation Challenge to help build applications for the gigabit web. How can we help people make new things, learn in new ways, be healthier, happier, and safer using the 1 Gbps programmable web of the future? We are building a community of practice making public benefit apps & services on next gen networks. Developer Productivity (Erin Lancaster) - We are collecting ideas on how to improve developer productivity at Mozilla. All ideas are welcome: tools, process, big, small, whatever! IdeaBind (Wilson Guaraca) - Our goal is mold ideas into something real. IdeaBind provides a space where anyone can provide feedback or contribute to a user submitted idea. Firefox Developer Tools (???) - The Firefox Developer Tools team will be showing off the latest in web and browser development tools to anyone interested in hacking on web apps, add-ons or the browser itself. Firefox Metro (Windows 8) (Asa Dotzler) - Firefox Metro is a touch-optimized browser built from the ground up for Windows 8. It's designed for comfortable touch browsing and the same time works well with mouse and hardware keyboard. Firefox Metro has a set of unique features to demo, including a clean and visual Start Page, in-context auto-complete screen, on-screen re-positional controls, windows 8 edge gesture-based browsing, etc. WebFWD & Hatchery (Aaron Druck) - WebFWD is the Global Accelerator Program of Mozilla, helping startups from all around the world build and grow businesses. We work with startups with products that align with Mozilla's mission of promoting openness, innovation, and opportunity on the Web. Mozilla Hatchery is a support program for Mozillian's who want to help invent new Mozilla products. Mozilla Hatchery provides lots of support to take your prototype or product idea to the next level. We offer coaching, resources and curriculum across various disciplines - user research, testing, design, product development, marketing and more - with a goal to help build Mozilla's future products and services. UX (Aaron Druck) - This booth will showcase design work happening around Mozilla. We will staff the booths with designers during the Innovation Fair. We will have a display up with a running Keynote presentation that will showcase design work. There will also be printouts and mockups of design work posted up at the booth. We will also be handing out a UX Newsletter at the booth, posting up some design posters and handing out design schwag. UXR (Bill Selman) - The UXR booth will showcase User Research design studies and methodologies. Battery Harness (Jon Hylands) - I'm designing and building a battery harness that allows Firefox-OS phones (currently Hamachi, more to come) to have their battery usage monitored. This project combines a 3D printed part, a custom designed printed circuit board, a third-party usb ammeter, and some software that runs on a PC. This will allow developers to monitor real-time power consumption of their phone while developing applications, features, and bug fixes. Electrolysis (David Anderson) - Electrolysis is an on-going research project for multi-process tabs in Firefox. We'd like to demo the responsiveness and speed improvements to the Firefox UI, and give interested people information on how they can help. Panda Chassis & Mozpool (Jake Watkins) - Panda Chassis is an open source rack mount hardware chassis designed to hold small development boards called Pandaboards. It was designed within Mozilla to provide housing of Release Engineering's Pandaboard pool at scale which currently stands over 900 Pandaboards. Mozpool is a software platform designed to manage the Pandaboards with the Panda Chassis. It maintains constant state on all Pandaboards within the pool and provides a REST API for allocating boards for testing on demand. It also has features such as automated hardware diagnostics and reprovisioning boards with a different OS such as Android, Firefox OS or Linux. FHR (Firefox Health Report) (Schalk Neethling) - "This is your Firefox's health report. It tells you how your browser is doing, provides advice, via helpful links, when your browser seems ill and, helps us make a better, healthier browser for you. And all of this is done without compromising your privacy or security. You can find it at about:healthreport on both desktop and Android." Lantea Maps (Robert Kaiser) - "Lantea Maps is a pretty simple web app for maps that I can show running on desktop, Android tablet and Firefox OS phone. It uses OpenStreetMap by default, can record GPS tracks - and on the desktop/laptop I can show a self-built custom navigation pad for it (made out of cardboard, tinfoil, and a MakeyMakey board). I have done all that as fun side projects to learn how to hack something together with simple tools, and how our web app ecosystem works." Platform Games Initiative (Alon Zakai filling in for Marco) - The platform games initiative is primarily focused on making Firefox the best it can possibly be at running games. Our goal is to make HTML5 rock on both Desktop and Mobile! Firefox Marketplace (Sakina Groth, Rob Hudson, Alex Lakatos) - Come find out what's in the works for Mozilla's HTML5 app marketplace. Talk to staff and see some demonstrations of collections, new concepts in app discovery, developer tools, and payments. Our app review team will be there as well to talk to you about becoming an app reviewer. What's New in Firefox Add-ons (Dan Buchner) - We will demo excellent new add-ons for Firefox on Android, and talk about our current and upcoming projects to make the add-on experience even better. App Developer Tools (Bill Walker) - Check out the next generation of Developer Tools for working with Firefox OS apps, the App Manager, which includes a simulator and on-device debugging. Socorro, crash-stats.mozilla.com (Peter Bengtsson) - Discover what is new in the world of crashes! New search tools, new public API, new custom reports... Come and see what Socorro can do for you know, and let us know what you would like it to do for you tomorrow. Verbosio - An experimental XML editor project (Alexander J. Vincent) - Verbosio is supposed to be a platform for editing XML markup, where each XML language (XHTML, MathML, SVG, RDF, XUL, etc.) can be an add-on. That's the theory, anyway. But building an editor is very hard - harder still when you have a full-time job and college courses. Australis Firefox Redesign (Stephen Horlander) - Try out the new theme for desktop Firefox and find out more about the upcoming changes. OpenType-SVG color and animation in fonts (Jonathan Kew) - "The idea is to showcase the recently-implemented support in Gecko for embedding SVG graphics as glyphs within OpenType fonts. This feature opens up new possibilities for multi-colored and even animated glyphs - think of ""emoji"" for the Japanese teen market, but also ornate headline fonts and decorated initial capitals, as well as corporate logos, icons, map symbols, etc. Talkilla (Dan Mosedale) - Talkilla is a videophone that makes it easy to talk with friends or co-workers. Chat across one or more web sites - no need to struggle with multiple apps or windows. Open Badges (???) - The Open Badges Infrastructure makes it possible for badges issued by different teams and organizations to be interoperable and shareable across the Web. Thousands of earners around the world are using these Open Badges to realize increased learning and professional opportunities. Learn more about how you can issue badges to project contributors at the fair and @OpenBadges! Webmaker.org (Brett Gaylor) - Come test and learn about Webmaker.org! We've got tools, content and communities that are building a web literate planet. Come learn what this community of thousands of passionate makers and mentors did this year at the Maker Party, and where we plan to go next! OpenNews (Erika Owens) - OpenNews is a collaboration between the Knight Foundation and Mozilla that's dedicated to building an ecosystem to help journalism thrive on the open web. It's about producing next-generation web solutions that solve real problems in news. It's about supporting communities of developers and journalists as they make, learn, and invent together. And it's about deploying fellows—and code—into news organizations to collaborate and innovate in new ways. Daala (Gregory Maxwell) - Daala aims to displace the ruling video codecs with a technically superior and royalty-free one. We love to explain how video coding works, how Daala is different, and we have a ton of cool demos to show you of the various techniques. Mozilla Ignite (Will Barkis) - Building the Gigabit Web (Will Barkis) - Mozilla Ignite (mozillaignite.org) is an Open Innovation Challenge to help build applications for the gigabit web. How can we help people make new things, learn in new ways, be healthier, happier, and safer using the 1 Gbps programmable web of the future? We are building a community of practice making public benefit apps & services on next gen networks. Jocly (Michel Gutierrez) - Jocly is a web application for playing and developing board games (about ~50 games integrated so far). It makes use of WebGL and WebRTC technologies to bring both opponents' webcam streams into the live playing board 3D scene for a great immersion experience. Developer Productivity (Chris Peterson) - We are collecting ideas on how to improve developer productivity at Mozilla. All ideas are welcome: tools, process, big, small, whatever! Firefox Metro (Windows 8) (???) - Firefox Metro is a touch-optimized browser built from the ground up for Windows 8. It's designed for comfortable touch browsing and the same time works well with mouse and hardware keyboard. Firefox Metro has a set of unique features to demo, including a clean and visual Start Page, in-context auto-complete screen, on-screen re-positional controls, windows 8 edge gesture-based browsing, etc. WebFWD & Hatchery (???) - WebFWD is the Global Accelerator Program of Mozilla, helping startups from all around the world build and grow businesses. We work with startups with products that align with Mozilla's mission of promoting openness, innovation, and opportunity on the Web. Mozilla Hatchery is a support program for Mozillian's who want to help invent new Mozilla products. Mozilla Hatchery provides lots of support to take your prototype or product idea to the next level. We offer coaching, resources and curriculum across various disciplines - user research, testing, design, product development, marketing and more - with a goal to help build Mozilla's future products and services. UX (Casey Yee) - This booth will showcase design work happening around Mozilla. We will staff the booths with designers during the Innovation Fair. We will have a display up with a running Keynote presentation that will showcase design work. There will also be printouts and mockups of design work posted up at the booth. We will also be handing out a UX Newsletter at the booth, posting up some design posters and handing out design schwag. UXR (Cori Schauer) - The UXR booth will showcase User Research design studies and methodologies. Platform Games Initiative (Martin Best) - The platform games initiative is primarily focused on making Firefox the best it can possibly be at running games. Our goal is to make HTML5 rock on both Desktop and Mobile! Firefox Marketplace (Matt Basta, David Bialer, Lisa Brewster, Potch) - Come find out what's in the works for Mozilla's HTML5 app marketplace. Talk to staff and see some demonstrations of collections, new concepts in app discovery, developer tools, and payments. Our app review team will be there as well to talk to you about becoming an app reviewer. What's New in Firefox Add-ons (Andrew Williamson, Mike Kapley) - We will demo excellent new add-ons for Firefox on Android, and talk about our current and upcoming projects to make the add-on experience even better. SpeechRTC (Andre Natal) - A speech recognition web api built on top of webrtc. After the summit the project will be published to github. Fully working on Firefox OS and desktop browser. rr (Robert O'Callahan) - A research project that supports full recording and replaying of Firefox executions on Linux. Firefox Accessibility (Yura Zenevich (David Bolter)) - Explore the ways Firefox (Desktop and Android) makes web accessible for all users. Discover how Firefox works with various assistive technologies such as screen readers and braille displays. Many Mozillians have never seen these novel ways of interacting with Firefox, or for that matter, a computer (infrared tracking, switch and sip-and-puff devices). This is a chance to see and experience this cool technology. Bug Board (Liz Henry) - The Mozilla bug wrangler team will demo their bug triage tutorial and leaderboard! App Developer Tools (J. Ryan Stinnett) - Check out the next generation of Developer Tools for working with Firefox OS apps, the App Manager, which includes a simulator and on-device debugging. Firefox for Android (Margaret Leibovic) - Discover why Firefox for Android is the best mobile browser out there, and what new and exciting things we have planned to make it even more awesome! Mozilla Appmaker (Flathead) (Bobby Richter) - Appmaker is a mobile app development platform which provides the web-based building blocks to build apps without any programming. Still in its infancy, the Appmaker team -- already comprised of Foundation and Corporation, and community members -- is doing research and continuous development to provide the most powerful and accessible solution. Crimson Twins (Mike Cooper) - Crimson Twins is a set of software to power ambient displays, such as TVs mounted on walls in the office. It is remote controllable, easy to manage, and can run in any modern browser. Socorro, crash-stats.mozilla.com (Selena Deckelmann and Brandon Savage) - Discover what is new in the world of crashes! New search tools, new public API, new custom reports... Come and see what Socorro can do for you know, and let us know what you would like it to do for you tomorrow. BzDeck (Kohei Yoshino) – A useful experimental Bugzilla client demonstrating modern Web application technologies such as CSS3, DOM4, HTML5, ECMAScript 6 and WAI-ARIA. BzDeck now supports Firefox for Android and Firefox OS. 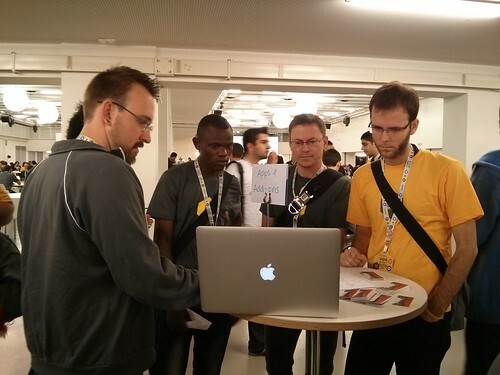 Drop by our booth to discuss how your Bugzilla experience can be improved! Follow us on Twitter, Facebook or Google+ for further updates. Mozmill CI (Henrik Skupin) - Mozmill CI is our continuous integration system for Mozmill related tests, which help the QA team to sign off from upcoming Firefox releases and their updates. We are working together with developers to get more functional tests added, with localizers around the world to make Firefox more shiny in terms of localization. Australis Firefox Redesign (Mike Conley) - Try out the new theme for desktop Firefox and find out more about the upcoming changes. Free (as in freedom) Firefox OS (Ricardo Panaggio) - There are a few bits of Firefox OS that are not free, like kernel blobs, and a few that would cause sadness on freedom fighters (like not being able to filter apps by license on Marketplace), or the use of software as a service like everything.me, where the service software isn't free. This is a starting project that aims to free (as in freedom) Firefox OS and related stuff (e.g. the Marketplace). Let's talk about how we can improve Firefox OS respect for the users and the community. Webmaker.org Kate Hudson / Gavin Suntop - Come test and learn about Webmaker.org! We've got tools, content and communities that are building a web literate planet. Come learn what this community of thousands of passionate makers and mentors did this year at the Maker Party, and where we plan to go next! Daala (Jack Moffitt) - Daala aims to displace the ruling video codecs with a technically superior and royalty-free one. We love to explain how video coding works, how Daala is different, and we have a ton of cool demos to show you of the various techniques. APC (Joshua Smith) - APC runs the Firefox Operating System, optimized for desktop. This project has enormous potential to revolutionize the desktop platform. My purpose for running a booth is to spread the word, and to onboard some techies for development contests that will speed up the release. Developer Productivity (Lawrence Mandel) - We are collecting ideas on how to improve developer productivity at Mozilla. All ideas are welcome: tools, process, big, small, whatever! This page was last modified on 25 November 2013, at 19:37.